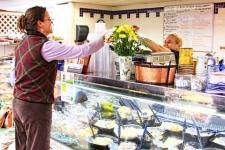 Boars Head is continually voted as the best quality deli meats in the USA. We proudly slice Boars Head meats and cheeses along with our other quality brands. We try to have all the price ranges covered to satisfy every taste and budget. Our cheese island is stocked with lots of cheeses from all over the world. Haloumi from Cypress, French Bries, Feta from Greece, Cheddars from Ireland, Scotland and Wales, Blue cheese from Denmark and many quality US cheeses with others too numerous to mention. We are very proud of our Deli staff. They are knowledgeable and friendly. Stop in and tell them what you are looking for. Try our homemade potato salad and our other homemade salads. We want to sell only quality salads and the best way to do that is to make them ourselves. Our Hot Deli features fried or rotisserie chicken…both are strictly quality and the best tasting anywhere. We also have daily specials for lunch, like our prime rib burgers, homemade Coney dogs and Friday fish fry.